If you’re like most people with a LinkedIn account, you know it’s a great tool for growing your network and growing your business, but you’re not sure how to best spend your time on LinkedIn activities. There’s a little-known way for using LinkedIn to let your entire network know exactly what you’re doing, and as a result, you get free publicity. The secret? Writing LinkedIn Posts. Is it something that would be considered news, or are you helping educate your readers? Free publicity can be yours if you concentrate on the latter. LinkedIn Updates should be used to discuss your latest happenings. Are you hanging out at a networking event or trade show? That’s a great time to post an update. Did your company recently hire a new employee? That’s a great update too. Heck, even use updates as the way to promote things about your business. LinkedIn Updates are only shown to certain people who have shown an interest in what you’ve shared before. Think of it like a Facebook News Feed – yours is going to be different than everyone else’s, based on your interests and past behavior. 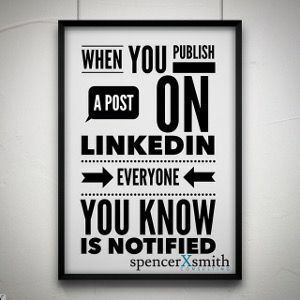 In a nutshell, think, “Could you see LinkedIn colleagues of yours sharing your post because it would help them look good or look smart to their peers?” If not, just do a LinkedIn Update, and save your LinkedIn Posts for when you have something valuable and educational to share that will benefit your target audience. Need some writing ideas for your LinkedIn Posts? Check out how to write your first article in under an hour. thanks for sharing this information. I’ve been using the linked in publish posts and it’s starting to get a bit of feedback. Keep up the wonderful work! Thanks so much for your kind words, Michael! I’m really happy to hear you liked this video, and that you’re already taking advantage of this awesome feature of LinkedIn. 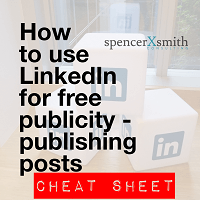 Get my step-by-step CHEAT SHEET: "How to Use LinkedIn for Free Publicity"